Like his colleague, Sergio Leone, Corbucci got his start in torch and toga epics before moving on to the dusty streets and deserts of the wild west. Some of the peplums and fusto adventures featured stories that could be successfully transplanted to westerns, or war pictures. Son Of Spartacus is one such film in that it imitates Zorro. On a mission from Caesar to spy on a potential usurper named Crasso, Rando is shipwrecked on an island and captured by slave herders. Befriending another captive, Rando learns that the emblem he wears is a sign that he is of relation to the dead rebel warrior, Spartacus. Once they escape, he is taken to the dead rebel leaders tomb where he gains possession of his helmet, shield and armor. Rando then begins a double identity freeing Spartan slaves and leaving the mark of an 'S' in the blood of his enemies while pretending to be on the side of the tyrannical Crasso. Steve Reeves appears more energetic than he did in other similar movies. Apparently, injuries suffered during the shooting of The Last Days Of Pompeii, 1959, took their toll on the actor. Corbucci previously directed Romulus and Remus, 1961, a sword and sandal classic of epic proportions. His penchant for grim violence is evident here with a decapitation and a man with melted gold poured on his face. 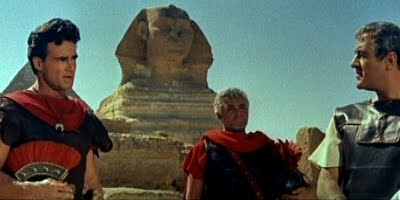 The film also benefits from location shooting in Egypt. Recommended for peplum and Corbucci fans.